Plenty of attention to detail has gone into both designs. They come with an extra long, adjustable ground spike, which is much thicker walled for strength and rigidity. 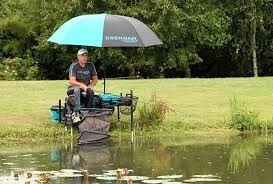 The extra ground clearance also helps to alleviate a common problem with fishing brollies. The special shallow frame canopy gives you plenty of head space, plus we have re-designed a machined brass angle-tilt mechanism that securely locks at hori­zontal, 30º and ver­tical angles. Both models incorporate PU coated, rot-proof, poly­ester with taped seams to keep out the ele­ments. At just 2.35kg, the 44in Drennan Umbrella is really lightweight and transportable, while the larger 50in model features slightly heavier 210d fabric to make it more of a ‘deluxe’ choice.